(Bloomberg) -- Colony Capital Inc., the investment firm run by Tom Barrack, reached an agreement with one of its investors that will see it add directors and conduct a strategic review. The Los Angeles-based company said in a statement Monday that Raymond Mikulich and Craig Hatkoff will join its board immediately as part of a pact with Blackwells Capital. Colony and Blackwells will jointly agree on a third new director at a later date, according to the statement. Colony also said it has formed a strategic asset review committee, which will make recommendations to the board on issues related to the company’s assets and business configuration. Both Mikulich and Hatkoff will sit on the committee. Blackwells, which owns about 2 percent of Colony, believes the company could be worth $11 a share if it were to reconfigure its operations, a person familiar with the matter said. That would be about an 80 percent increase from where Colony’s shares were trading in New York Monday. Colony rose about 4 percent, to $6.17, at 9:44 a.m., giving the company a market value of about $3 billion. Colony’s shares have fallen sharply since combining with NorthStar Realty Finance Corp. and NorthStar Asset Management Group Inc., deals that boosted assets but not profits. Its shares were down about 63 percent through Friday’s close since closing that deal in January 2017. 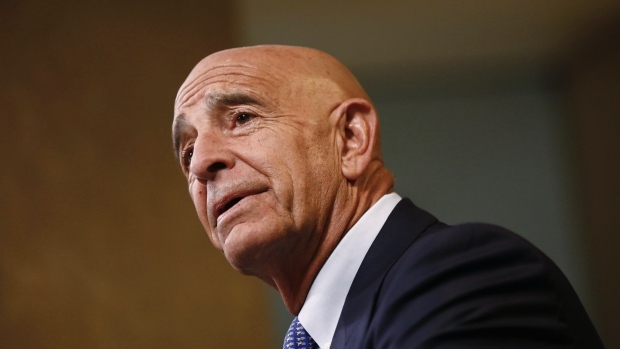 Barrack, a long-time ally of President Donald Trump, resumed his role as Colony’s CEO in November after the board ousted his deputy, Richard Saltzman. --With assistance from Caleb Melby.